In 2010, the Unitarian Universalist Association began selecting an annual Common Read. "A Common Read invites participants to read and discuss the same book in a given period of time. A Common Read can build community in our congregations and our movement by giving diverse people a shared experience, shared language, and a basis for deep, meaningful conversations." 1. Mitra Rahnema, Ed. 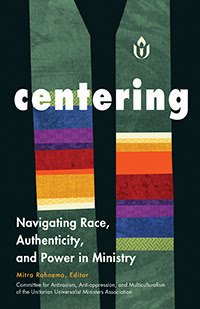 Centering: Navigating Race, Authenticity, and Power in Ministry. CLICK HERE. This anthology, a joint project of the UU Ministers Association's Committee for Antiracism, Anti-oppression, and Multiculturalism (UUMA-CARAOMC) and Skinner House Books, is the first book to center the stories, analysis, and insight of Unitarian Universalist religious leaders of color as they explore how racial identity is made both visible and invisible in Unitarian Universalist communities. In October 2015, a group of distinguished UU religious professionals of color gathered together in Chicago, sponsored by UUMA-CARAOMC, to embark on a radical project. The conference worked from the premise that discussions of race in Unitarian Universalism have too often presupposed a White audience and prioritized the needs, education, and emotions of the White majority. The goal was to reframe UU anti-oppression work by putting the voices, experiences and learnings of people of color at the center of the conversation. The resulting book captures the papers that were presented and the rich dialogue from the conference to share personal stories and address the challenges that religious leaders of color face in exercising power, agency, and authority in a culturally White denomination. The editor, Rev. Mitra Rahnema, is a biracial Iranian American lifelong Unitarian Universalist. She is currently offering her ministry at the Unitarian Universalist Church of Long Beach, California. Prior to Long Beach she served communities in Grosse Point, Michigan; Mission Viejo, California; and Kansas City, Kansas. She is currently a member of the UUMA-CARAOMC. She has dedicated her life toward building vibrant and engaged anti-oppressive communities. 2. 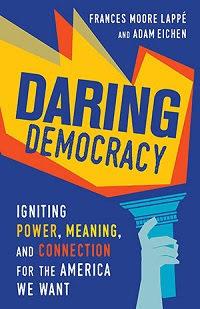 Frances Moore Lappé and Adam Eichen, Daring Democracy: Igniting Power, Meaning, and Connection for the America We Want. CLICK HERE. This optimistic book on the importance of democracy itself examines the anti-democracy movement that led to the Trump presidency, then offers a vision and call to action to save the democracy we thought we had and to take our civic life to a place it has never been. What do we do now? Organize and fight to protect and expand our democracy. With our democracy in crisis, many Americans are frightened and uncertain. So, the legendary activist Frances Moore Lappé, and organizer-scholar Adam Eichen teamed up to tell the underreported story of a "movement of movements" arising to tackle the roots of the crisis. The authors view the Trump presidency as a symptom of a shocking anti-democracy movement and expose the events that drove us to this crisis. But their focus is on solutions: how people from all backgrounds, committed to an array of social-justice causes, are creating a canopy of hope, what Lappé and Eichen call the "democracy movement." The arising democracy movement's innovative and inspiring strategies are enabling millions of Americans to feel part of something big, historic, and positive. Democracy is not only possible but essential to meet the most basic human needs for power, meaning, and connection; joining the democracy movement is thus a daring and noble undertaking calling each of us.